These custom designed treat bags are perfect to add to your candy or treat buffet table! They also make great favor bags for other types of goodies! For current production time, see the shipping tab on this item. Rush processing is not available. Proofs are sent by request only. Standard delivery time for bags is 3-5 business days after an order ships (international delivery time varies). Shipping upgrades can be chosen once your order is added to your cart. Shipping upgrades include upgraded postage only, and do not decrease production time. All shipping is done through the USPS. Colors may vary from what is seen on screen due to differences in monitor and display settings. Please see my color chart photos in each listing for the best estimate of printed colors. Proofs and sample images are graphic representations, not actual photos of printed items. Please read my policies for more info. Payments are processed by Etsy. I currently accept any payment methods Etsy will accept. Orders are created upon confirmation of payment. See returns/exchanges policy above for details on returns, refunds, or cancellations. Processing time can be found in the shipping information tab on each listing. Proofs are sent by request only. Failure to respond to a proof may result in an order being shipped later than the stated production time. I will assume you have waived the proof approval step after a minimum of 24 hours have passed since the proof was sent, and the order will be shipped as shown in the proof. All items are shipped via USPS First Class (totes, stickers, prints) or Priority Mail (favor bags). All international orders are shipped using USPS First Class International. Delivery confirmation/tracking numbers are provided whenever possible. Expedited shipping is available. Upgrades can be chosen from your cart once your order is added. Shipping upgrades cover the increased price of postage only and DO NOT include rush processing. Please note that delivery dates cannot be guaranteed, and refunds are not given if an order arrives after the event date. Please DO NOT order last minute without a backup plan in place! Cancellations must be made at least 24 hours before the scheduled ship date, or before a proof is approved if a proof has been requested. After this time, cancellations will be approved based on whether the order has been printed yet. Cancellations are not accepted on any item that has already shipped. Refunds on shipping paid will be given in full on any order that has not shipped yet. Everything in my shop is made to order. Due to the custom and personalized nature of my products, returns are not accepted. WHOLESALE ORDERS: Cancellation must be made within 48 hours of when the order is placed for a full refund. A 10% cancellation fee will be deducted from a refund for cancellations made after 48 hours but before the order is printed. This is to cover time and materials spent preparing the order. Once printing has started, a refund will only be given for the quantity not yet printed. Color charts are included in the photos on each listing. These charts are scans of the colors printed on the material used for that product (bag color chart printed on bags, sticker color chart printed on stickers, etc.). These images are the closest estimate of what the color will look like printed. Please use color chart numbers to request color changes at checkout. The color charts for different items are slightly different! They are printed on different materials and sometimes with different printers, which show the colors a bit differently. 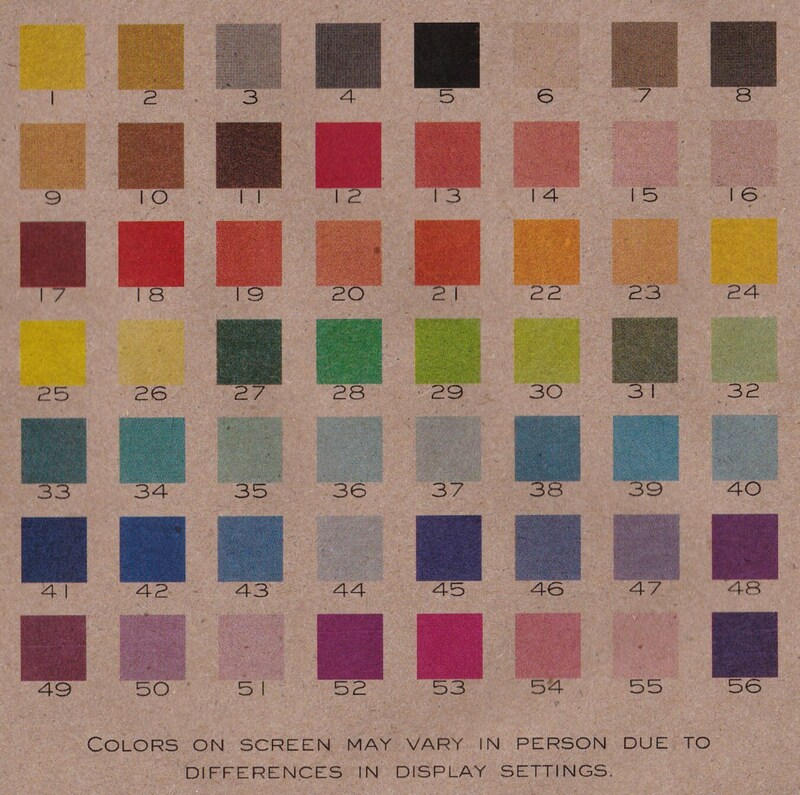 Make sure you are looking at the corrent color chart when selecting colors. Metallic inks and white ink are not available on any products. DO YOU TAKE RUSH ORDERS? I am not able to offer rush orders at this time. I do offer expedited shipping. Just choose to upgrade shipping during checkout! Just remember that I cannot guarantee delivery dates, so order as far ahead of time as possible and make sure you have a backup plan if you decide to risk a last minute order. WHAT IF I NEED TO ORDER MORE LATER? I make sure I save the files for the orders I print, just in case you should decide you need more! Just order the additional items you need and leave me a note during check out saying you'd like the same design as your previous order. WHY AREN'T THE COLORS A PERFECT MATCH? The inks on different items may be slightly different colors even when the same color number is chosen. One reason for this is because I use different printers for each, and they use completely different types of inks. The different types of materials used for different products also accept inks differently, which causes further variation. This makes it very difficult to color match, but I work to get them as close as possible. HOW MUCH CANDY PER GUEST IS TYPICAL FOR A CANDY BUFFET? Most sources I have found recommend 1/4 to 1/2 a pound per guest. Remember that some guests may not take any, but others may take extra, or take some home for others. It's better to be cautious and order some extra than to run out and have guests go without! WHAT SIZE PAPER BAG SHOULD I ORDER? This is hard to recommend. The most common size people order is the medium size by far, and that's what I recommend in most cases. If your buffet will have mostly larger candies and treats, the large size might work best. Popcorn usually works best in the larger size. The small size works best for very small candies, like M&Ms, or for individual favors to be prepared ahead of time and placed at each guest's seat. WHAT ARE THE BAGS MADE OF? I currently offer 2 types of paper bags, including white paper and brown kraft paper. Both are made from recycled materials. They are single ply and are not recommended for greasy foods that may leak through the paper. Please note that kraft colored bags are made from 100% recycled materials, which means the color of the bags may vary slightly. This will usually only be noticeable if you want to order additional bags later, or if you want multiple sizes. I try to make sure a single order is done with the same lot of bags, but this isn't possible with later orders or orders including multiple sizes of bags. Drawstring fabric bags are made from 100% cotton. WHAT DO YOU SUGGEST TO CLOSE THE PAPER BAGS? 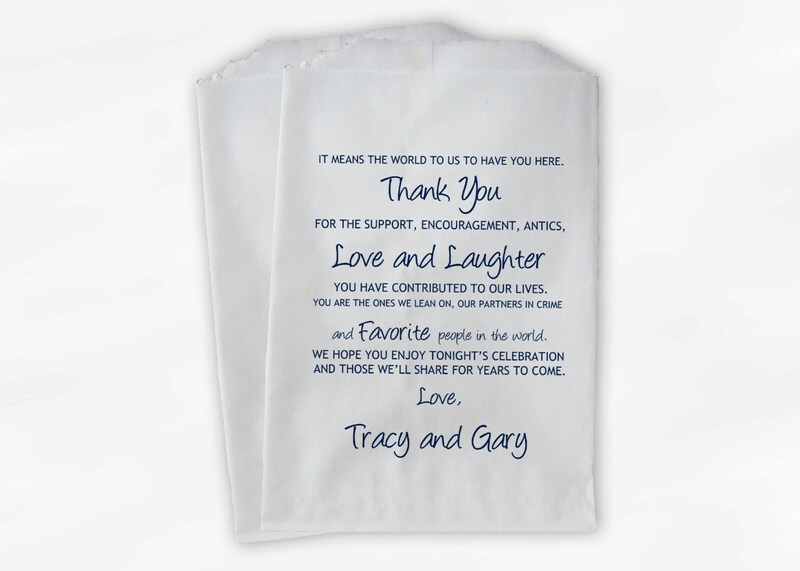 The bags can simply be folded over at the top, or you can provide stickers for your guests to seal them with. I offer a few sticker styles in my shop. I recommend the 1.5" size for small and medium bags, and 2" for large bags. The 1" stickers work on the small bags too, but they are best with designs that are not very detailed since they are so small. If you are preparing completed favors ahead of time, you can also use a hole punch to thread string through the bag and tie them closed. Colored bakers twine is perfect for this! Colored washi tape also makes a fun closure. See the photo at the top of my shop page for some ideas! ARE THE BAGS WATER / GREASE PROOF? The white and kraft bags are single ply paper and are NOT grease proof. The inks I use for the bags are waterproof. They will not run if they get wet or greasy. Drawstring bags are not water or grease proof. They are printed with a water based ink, so the design may bleed if they are exposed to water or grease. ARE THE STICKERS WATER PROOF? The stickers are printed using a water based ink, so they will run if they get wet. The stickers themselves are also not waterproof. They are not recommended for anything that may get wet or collect condensation. My baby milestone stickers are printed on waterproof paper. Perfect for drooly babies! WHAT SIZE STICKER SHOULD I ORDER? If they are going on my bags, I recommend the 2" for large bags, and the 1.5" for the medium and small. I also recommend 1.5" to seal most envelopes. The .75" is great for adding to candies, like the bottoms of chocolate kisses or mini peanut butter cups. With the .75 size, I recommend going with a simple design, since it may be hard to read small writing on that size sticker. WHAT ARE THE PRINTS DONE ON/WITH? All prints are printed on high quality semi-gloss photo paper with archival quality inks. Canvas prints and file downloads are not currently available.